The value of a Hydro-Electric - 14 cents 1946 stamp depends on several factors such as quality and wear, supply and demand, rarity, finish and more. Values in the section are based on the market, trends, auctions and recognized books, publications and catalogs. This section also includes information on errors and varieties and characteristics. 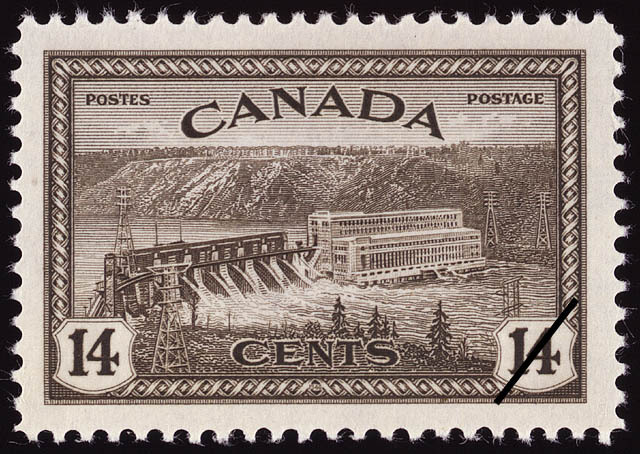 On this stamp, a view of a hydro-electric power station on the St. Maurice River, Province of Quebec. Since water power developments are of paramount importance to Canada's manufacturing industries, the design emphasizes how richly Canada is endowed with these resources.